Trading Places: China and the U.S. It would not be fair to compare Mao Zedong to either President Bush or President Obama. Neither has swum the Yangtze River and neither was a rabid communist. 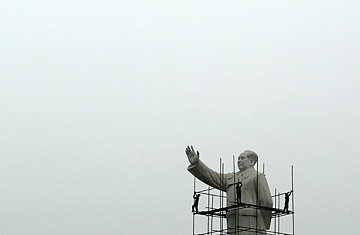 Mao created the central government system that is currently being dismantled. Bush and Obama may be remembered by historians as the American leaders who centralized much of the financial and industrial portions of the U.S. economy. China now allows most of it major companies to be privatized and traded on public stock exchanges. It is the largest owner of U.S. Treasuries in the world and a major investor in private businesses through its sovereign wealth fund. The Chinese banking system has clearly been developed by the government to encourage the creation of private enterprise. Parts of the financial and commercial structure of China are still owned by the state, but the government's once-famous totalitarian grip on the economy appears to be loosening some each year. The liberalization of China's business may recede to some extent because the recession will cause the level of government support for the economy to grow to keep GDP from contracting. The nation's prime minister says GDP will grow 8% this year, which seems nearly impossible. But if the government does have to offer financial support to the banks and industry, it will certainly come with some strings attached and may even cause the central government to take larger shares in businesses that it had planed to privatize. But, the move in China seems to be relentlessly toward a free market economy. Because China has a rich treasury, it can afford to support a rotation to privatization without the immediate concern that its government will be troubled by huge deficits. The U.S. faces both large deficits and the need to take de facto control of parts of the credit, financial, and industrial sectors. In effect, the amount of the nation's economic activity controlled by the government will rise to a level which would have been unimaginable even months ago. There is no way to predict what the American or Chinese system will look like in ten years. If the recession in the U.S. lasts another two years, the amount of GDP that is effectively under government control will increase rapidly as the Administration and Congress do whatever they can to keep large industries from collapsing. On the other side of the Pacific, China may have the luxury of having an economy that continues to expand, even if it is at a much slower rate than at any time over the last decade. China can bankroll privatizations without worrying that the wealthy residents of the country will fight it in the legislature. By the end of the downturn, the U.S. may look more like China than China does, at least economically.